A courthouse is an unlikely place for victims of crime and trauma to find comfort, but a new addition to the Crime Victims Assistance Program in Columbia County seeks to do just that. 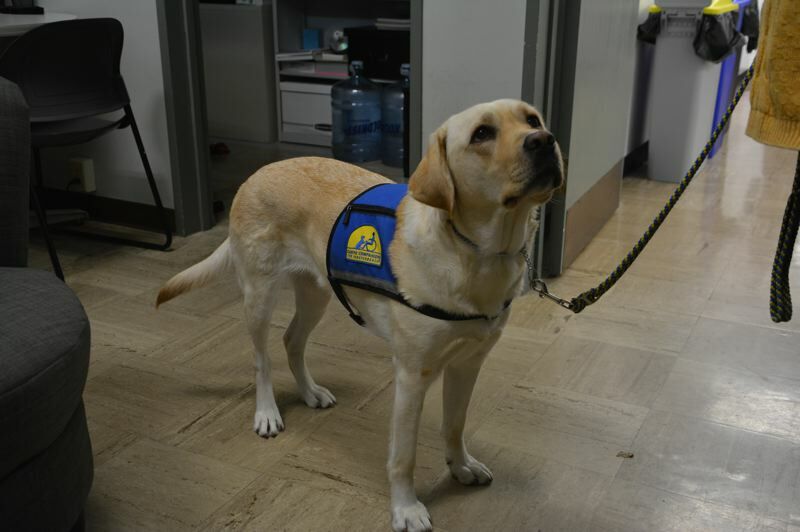 "Tilda," a two-year-old yellow labrador retriever mix, now makes her way to an office on the top floor of the Columbia County Courthouse every day. Her soft fur and calm demeanor have already brought solace to visitors who find themselves in the victims assistance program. Tilda is handled and overseen by Janice Faltersack, a nearly 25-year veteran employee of the program. Faltersack says since Tilda's arrival in June, she's helped adults and young children alike feel safer and more at ease while talking to staff at the victims assistance program office. The office is a branch of the District Attorney's Office. "The plan was just to bring her here a few hours, just to get her here," Faltersack explains. "When I had her here, the first thing that happened is a lady started petting her and stroking her. [Tilda] was the first thing she noticed, even before she saw me." Faltersack says the dog puts people at ease, which can be a good ice breaker. "Her presence makes it easier to kind of lead into things we have to talk about," she notes. Faltersack says Tilda's main job as a working dog at the courthouse is simply to "provide comfort." "She has a calming effect on the senses," Faltersack notes. "It's scary to come here. Having a dog here just makes it a little more normal for people." Soon, Tilda will venture beyond the courthouse and visit the Amani Center a few times a week, which provides child abuse assessment services in St. Helens. When Tilda isn't at work, she's at home, with Faltersack, where her service vest comes off and she "gets to just be a dog," Faltersack says. Service animals have become increasingly utilized over the past decade, and have a greater presence in public spaces. They've also been an effective addition to the psychological treatment model. An article titled, "Animal Assisted Intervention for Trauma: a systematic literature review" published by Frontiers in Psychology, indicates reduced anxiety and reduced symptoms associated with Post Traumatic Stress Disorder in adults when animals are introduced. The simple act of petting Tilda, or just having her nearby, can relieve stress and make people feel more comfortable, Faltersack notes. 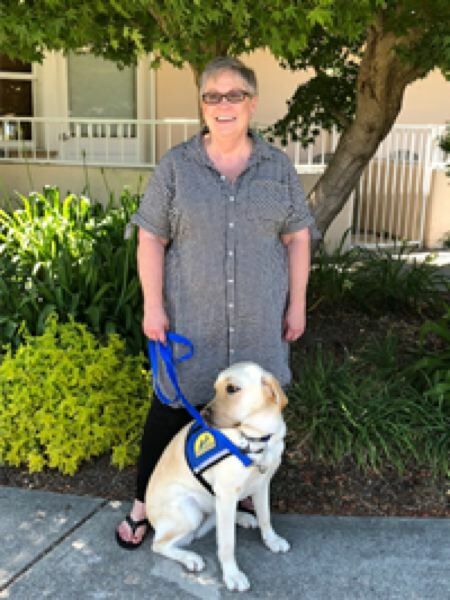 "She's nationally certified as a service dog," Faltersack says, noting Tilda underwent advanced training for 18 months through Canine Companions for Independence, a nonprofit organization that provided Tilda to the victims assistance program at no charge. While at her office, Tilda curls up, resting in a bed under a desk. On command, she's up and sitting patiently. 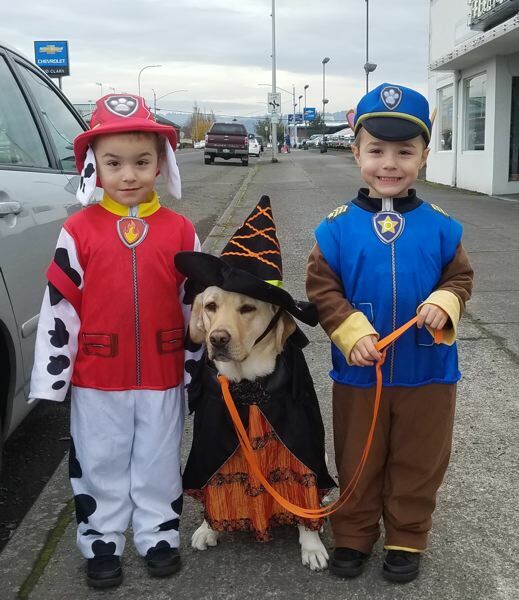 The dog knows over 40 commands, including pushing buttons to trigger doors to open for disabled people, picking up toys for children at the Amani Center, and being affectionate at just the right time. "Tilda, visit!" Faltersack says. Within seconds, the dog is headed toward her handler's lap. Almost all of Tilda's training came from Ken Millikan, a prisoner in a California facility approved to help train service dogs. The inmate told his supervisors that he wanted to give back in some way, to make up for the things that got him incarcerated. In a bittersweet outcome, Millikan died unexpectedly from health issues in 2017, a corrections facility article notes. "He would be so proud to know that Tilda is now a dog helping victims," Faltersack says.